Our 4th Annual Mid-Winter Conference on December 26, 2001 was dedicated to "Educating Toward Meaningful Tefillah." 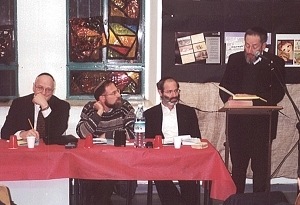 Left to right: Rabbis Winkler, Kahn, Gutenmacher, and Brovender. Planned to coincide with the publication of our monograph on Tefillah and the visit of the teachers from the Moriah School of Englewood, NJ, the conference featured a presentation by Rabbi Brovender, and responses from Dr. Beverly Gribetz (Principal, Evelina de Rothschild Secondary School), R. Daniel Gutenmacher (Yeshivat Mekor Chaim), R. Yair Kahn (Yeshivat Har Etzion), and R. Neil Winkler (Moriah).